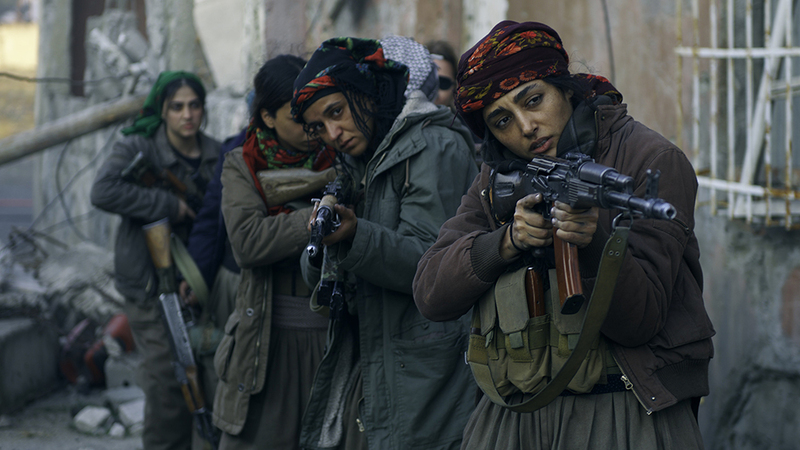 In director Eva Husson's sophomore effort, Girls of the Sun, a group of Kurdish decide to fight back against their former captors in the Islamic State, literally taking up arms against ISIS as part of the titular battalion. It's a film that debuted at last year's Cannes where it competed for the Palme d’Or. Nearly a year later and a new trailer preludes its release into theaters in just a few weeks. The film stars Emmanuelle Bercot and Golshifteh Farahani, the latter best known for her scene-stealing roles in Paterson and The Upside, and is based on the stories of real-life women who liberated themselves and fought against extremism. Included is a character based on renowned war photographer Marie Colvin, who was played by Rosamund Pike to some acclaim in A Private War. Here's the synopsis: Somewhere in Kurdistan, Bahar (Farahani), commander of the “Girls of the Sun” battalion, is preparing to liberate her hometown from the hands of extremists, hoping to find her son who is held hostage. A French journalist, Mathilde (Bercot), comes to cover the attack and bear witness to the story of these exceptional warriors. Since their lives have been turned upside down, the Girls of the Sun find themselves fighting for women, life, and liberty. Girls of the Sun opens April 12th.